Bring your audience to you! The power of community. We've had the pleasure of working with the multi-talented musician and all-around inspiring individual, Kate Schutt, over the past several months. In addition to being a soulful, talented performer, Kate has a lot to share with her world and her fans on her blog, where she write about her projects, musicians she admires, tips and thoughts about practicing and mastery, and more. Having her website as a hub is surely important for Kate to reach her fans as she is often on the go, but as a performer it's all about playing and sharing live and face-to-face. So, we were super excited when she played a house concert in NYC this past June with Newfoundland guitarist Duane Andrews. Duane and Kate performing as The Fierce Dreamers. So, the questions we ask you all are: How can you create your own opportunity to engage your community in what you do? How can you inspire through your creative abilities? It takes some planning and some hard work, but people like Kate can prove time and time again that it's all worth it and will bring you one step higher towards your goals each time. Thanks for sharing with us, Kate! This post was originally published on August 18th, 2014. We had the pleasure of working with San Francisco artist Liz Robb through our DELVE Toolkit. She recently was awarded a residency in Iceland for later in the year, and we wanted to make sure we caught up with her to see what else is going on and how the 1:1 DELVE Toolkit helped her practice. Can you briefly describe your path as an artist and how you came to seek out the DELVE Toolkit? Moving to San Francisco was really the catalyst for starting my career as an artist. I had previously created a body of work that I was proud of and my next steps were navigating through the business side of my work that came less naturally. After about six months of running my business on my own, I needed help with time management, writing, and applying to artist residencies and call for entries. I wanted a neutral opinion on my appearance as an artist outside of the feedback I received in school and via friends and family, which is why the toolkit was a good fit for my new business! Can you describe a day, or week, in your artistic life? I’m consistently changing and adapting the time and ways I work in my studio, and being accountable for every minute! Thankfully my schedule is very flexible and I’m able to focus on my studio first and foremost, which I feel very fortunate to do. A new weaving, work in progress. I work in my studio five days a week, generally during daylight hours. I start my day by writing in my sketchbook some ideas or things I’d like to accomplish for the week/month and then break them down into actionable tasks that I do on my day to day. Everyday is unique in what I do in my studio like whether I’ll research types of new materials or actually start dyeing or weaving something new. I also work part-time as a gourmet food delivery woman as well as a Lyft driver, which supplements my income so I’m able to sustain my studio practice as well as travel for inspiration! What is your favorite project that you've worked on (and/or are currently excited about/looking forward to working on)? I’m currently working on a series of white on white grids that complete different configurations within a space. I’m also experimenting with new materials like copper foil to create different surface textures that I’m jazzed about. More to come! Can you share what you've learned about your practice and how we've helped you? I learned to be more accountable for my time on a daily, weekly, monthly, and even yearly basis, which has continued to help me further understand where I want to go and how I can realistically get there. I have been re-reading my notes and aspirations from my time critically thinking and talking about my practice, which has been extremely helpful. It was difficult talking about my goals and myself as a singular artist, and now I feel more confident that this can continue to be a reality for me. I like to go on hikes and stroll with the pup, and am also an avid traveler, so it is a treat when I can explore far off lands and be completely immersed in a new space and time! I’m very excited to travel around Iceland for my textile residency this fall! Over the past several months we've had the pleasure of working with the wonderful Kate Schutt, musician and life-doer extraordinaire. After our very first meeting with Kate, one of the things that we were so impressed by was her lack of fear. She is someone who wants to tell her story, share her progress and connect with others in a real way. Kate needed a platform to re-connect with her adoring music fans and an online resource for her life-coaching clients, which included an authentic way to tell her story, visuals, an identity, and a clear and direct strategy to maintain her outward online communication for years to come. We're happy that Kate took some time to answer some questions for us below, and we hope that you'll be as inspired as we are by her commitment to her music, fans, loved ones, clients, and of course, herself. Thanks, Kate! Can you briefly describe your path as a creative professional and how you came to seek out Kind Aesthetic? I’ve been a professional musician—guitarist, singer, songwriter, arranger, producer—since 1999 and a life coach since 2011. My musical journey so far has been like all true journeys: exciting, interesting, hard, mysterious, pointless, painstaking, serendipitous, miraculous, boring, bewildering, humbling. I am so very grateful to have made music with more than a handful of my heroes and have had some of those people say very nice things about my music, my guitar playing, my songs, and my producing. Life coaching is a way of sharing the lessons I have learned along the way. As Gandhi said, “The best way to find yourself is to lose yourself in the service of others.” Helping people accomplish their biggest, most secret of dreams is such a privilege. As a life coach, it is my actual job to get people to a place where they say, “Pinch me! This is my life? !” How awesome is that? I tracked down Kind Aesthetic when I decided to get serious about my music blog and when I decided it was finally time to have a website for my coaching practice. A little back story might be in order. My mom was diagnosed with a rare and aggressive form of ovarian cancer in October 2011. I chose to leave NYC and move home to Chadds Ford, PA to be her primary caregiver. She went through a major debulking surgery followed by more than 20 rounds of chemo. Her care was so overwhelming and I was so in the trenches with it that I hardly played my guitar at all. Anyone who has ever had the experience of taking care of someone who is terminally ill knows exactly what I am talking about. Finally, in the summer of 2013, my mom went into remission, meaning there was no “visible sign of disease,” meaning the surgery and chemo had worked. She was given an indefinite amount of time to regain her strength and live a “normal” (ha!) life. I knew I’d have a window of opportunity (a breather, let’s say) to do something for myself before her cancer came back and she’d choose to start another brutal cycle of chemo. This time around, I vowed, was going to be different for me. This time I was going to make music as I was taking care of my mom and I wanted a way to share that music with my fans. I reached out to Kind Aesthetic to help me make that dream a reality. For the record, I was right: my breather came to an end. My Mom started radiation in February 2014 and has been taking a course of chemo every month since then. I am once again in the trenches. My days and weeks since my Mom got cancer don’t look ANYTHING like they used to; my world was turned upside down. My week is split between NYC and Chadds Ford, PA where my Mom and Dad live. Now that my Mom is in chemo, I spend 4 days in PA and 3 days in NYC depending on where my Mom is in her cycle of chemo. If she is feeling particularly terrible and having major side-effects from the chemo, I will stay in PA for a week or more. When I am at home in PA with her, I do Crossfit at 5am and then come home and make breakfast for her and Dad. I might get a couple hours in the morning to myself. If so, I will jump into work. I meditate, practice my guitar, work on song ideas, and have a coaching call or two with clients. Usually, the afternoons are filled with chores or errands for the household, calls to doctors or nurses, and tasks for my Mom (quite frankly, things she wants done before she dies). Late afternoons, I prep and cook dinner. After dinner, I read or watch a Joseph Campbell video with my Mom. And because I get up so early, I go to bed really early. Sleep is my secret weapon. If I am in NYC, my days are more monk-like. I am up at 4:15 for a 5:30 am for Crossfit class and then I do deep work: meditation, two to three hours of guitar and song work, coaching client calls, and calls with my own life coach. The afternoons are more flexible. I might be rehearsing for a show, teaching a guitar lesson, songwriting, practicing guitar, or reading. At night, I might have a gig. If not, I am practicing, reading, writing letters, or drawing. Some afternoons, I’ll go to a museum (the Met and the Cloisters are my two favs … but I go see whatever interests me). I never go anywhere without my black notebook and pen. Overheard conversations and slow walks through the Met are two sources of inspiration for song lyrics and drawings. Our next gig is in NYC at Rockwood Music Hall on Thursday, December 11, 2014. The show WILL sell out. You can get tickets here. I am always excited about my ongoing letter-writing, pen pal project called the Postcard Project. Basically, I ask (dare?) my fans to write me a postcard. If they do, they get one back. And if they write me a letter, they get a letter back. I’ve been sent letters in the form of scrolls, paper airplanes, blocks of wood. I’ve been sent some of the wackiest, tackiest postcards ever printed … for fun, I assume! The postcards come from far-flung place—the UK, Brazil, Japan, Austria. You better believe I get creative and send some tacky postcards back, too! I also send first drafts of songs, sketches, set lists, poems, etc. Lately, instead of asking people to sign up to my mailing list at my gigs, I have been bringing a stack of stamped postcards and having people fill in their address and leave them with me. I finish the gig and go home and write 10 or 20 postcards to the fans that came to see me! Super fun! You can read more about all the Postcard Project awesomeness here. Since we've worked closely together over the past few months, can you share what you've learned about your practice and how we've helped you? Kind Aesthetic has helped me see the 30,000 foot view of my musical life and, from there, pick and choose what to highlight online. Andrea and Sara have helped me articulate my story as a musician and present that story in a clear, compelling way. They have a million ideas for how to quickly and easily capture and present to the world (via my blog) the things I do without thinking (songwrite, collaborate, perform, practice, etc). For my life coaching practice, Kind Aesthetic has been helping me build a killer website from soup to nuts. Literally. They iterated many names and logo ideas and were always happy to go back and tweak things. They asked me insightful questions and ever so gently and cheerfully teased out my best thoughts and best writing. They were thorough too, studying up on other life coaching sites (as life coaching is not in their wheelhouse) to see how we could make a site that stood out in an increasingly crowded field. We are happy to share an interview with Annie Coggan, whom we have had the pleasure of working with over the past few months. Annie is an inspiring person who, like many creative people, wears many hats: she is a designer, artist, educator, writer, founder of a popular design blog called Chairs and Buildings, and a principal at Coggan + Crawford Architecture and Design based in Brooklyn, NY. Annie was a speaker at our DELVE: Fabrication event at the Textile Arts Center back in January. Since then, she has been working hard to reframe all components of her practice to more effectively be able to share them with the world. Her personal site is a beautiful look into the past twenty five years of furniture and art work, a collection of her writing, and a showcase of her Roommaking, which is how she frames her interior design work. Plus, she also just relaunched Chairs and Buildings, a popular design blog that she has been writing for the past seven years. Now, the new platform will dive deeper into design issues that bring forward how designers think beyond what the consumer requires. Each month presents a unique topic, investigations, photo essays and guest contributors. Read July's issue here on the subject Botanical. It's fantastic. Needless to say, working with Annie was fun and inspiring for us. We helped her archive her work, tell her incredibly unique story to the world, and learned so much from her ideas and unique way of thinking about design and history. Enjoy the interview, and thanks, Annie, for sharing with us! Can you briefly describe your path as a creative professional and what drives the unique vision for your furniture and embroidery projects, Roommaking and Chairs and Buildings? I studied History and Fine Art with architecture classes at Bennington College and I have a Masters of Architecture from Sci-Arc in Los Angeles. So I am a “progressively” trained architect–this means that I was educated to think like an architect but not always just make buildings. I always was attracted to more intimate scales and stories of space. For years as a young architect, our work was very service-oriented so to push myself I always had a battery of “other” clients like Virginia Woolf and Flannery O’Connor. Making spaces, places and objects for them specifically pushed my thinking and created my method of making things now. Now that our architecture practice at Coggan + Crawford is more constant and stable, my furniture and object work now meld into that world and all the work is highly charged and imaginative. No one day is the same because I have an active teaching schedule. I like to work on email, writing and general getting to know the world in the early morning, around 6:30 or so. I try to get an hour walk in everyday because I just think better if I get out. I meet clients and have meetings during the day. Evenings and weekends, I stitch and work on my furniture pieces. What is your favorite project that you've worked on, or are currently looking forward to? Immediately, I am working on a very small but delightful kitchen for a client, and on a wing chair that has embroidered facades and maps of Marie Antoinette’s Le Petit Trianon. I am also doing some long-range work on my Historic House obsession – should I write a book or should I make a historic house myself? These are the kind of things that go through my head! I appreciate that your method of working is artifact based; the result of working with you is a web site (in my case two) and a deep and thorough archive. For someone that is a maker, it was a relief that there would be a strong result after some pretty deep self-reflection. I found that you asked the right questions about my work so I could push the narrative of my process further. Well, Paris is always the first answer. But I am always very excited about house museums and understanding that kind of intimate domestic scale first hand. I have found making the time to have coffee with an artist friend really gets me going these days, something they say or something in their studio will want to get me back to my work table. I always want to work creatively so I rarely “need” inspiration; I just need more time to make. Annie Coggan is a designer, artist, educator, founder of Chairs and Buildings, and a principal at Coggan + Crawford Architecture and Design based in Brooklyn, NY. A native of Atlanta, Georgia, Coggan received her Bachelor of Fine Arts from Bennington College in Vermont and her Master of Architecture from the Southern California Institute of Architecture (SCI-Arc), Los Angeles CA. Her work has been exhibited at A D/B Project Space (Brooklyn), Gestarc Gallery (Brooklyn), Barbara Toll Fine Arts (Manhattan), the Textile Arts Center (Brooklyn), Mississippi CAAD Visual Arts Center, and more. She has curated exhibitions at TODA (New York), Irondale Center for the Arts (Brooklyn), amongst others. She currently is on the faculty at Pratt Institute and The School of Visual Arts in New York City. She has been featured in Furniture A+D, Journal of Architectural Education, design*sponge and Remodelista, as well being contributor to the literary journal A Public Space, AIA’s e-oculus, and Architect Mag. In 2010, she was an artist in residence at the Textile Arts Center in Brooklyn and continues to teach workshops and was a founding member of the Board of Directors. 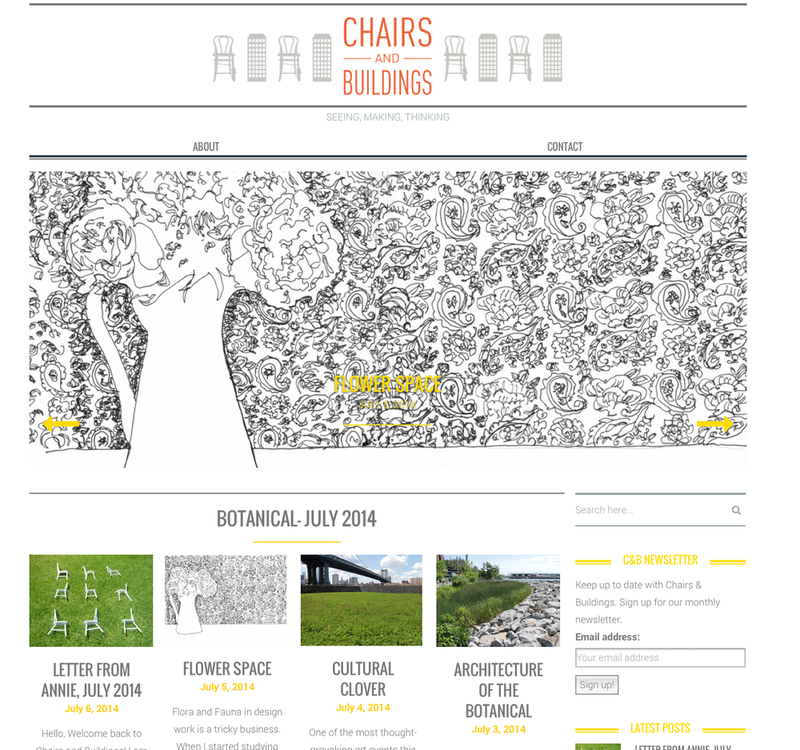 Coggan has recently re-launched Chairs and Buildings, a platform for expanding the discussion around design thinking.